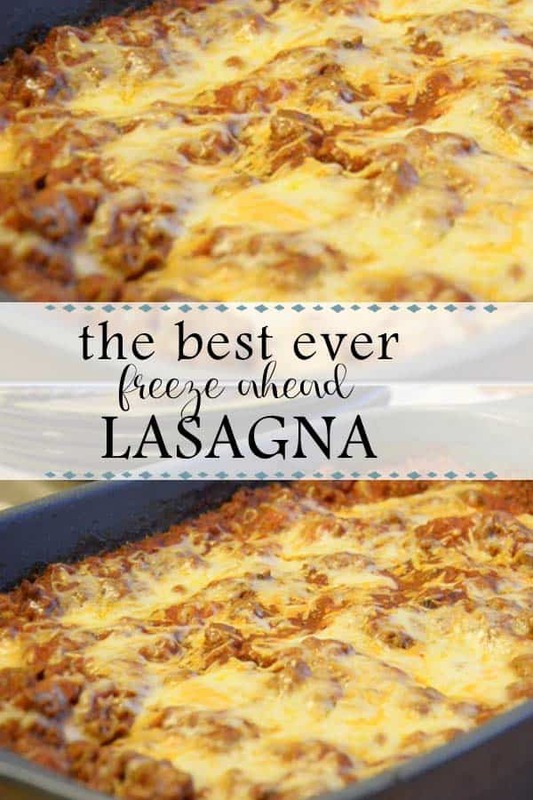 This is the best freeze ahead lasagna recipe I’ve ever found. It was dreamed up by my mother-in-law, and I’ve been making it for years. My mother-in-law is one of those cooks who rarely needs a recipe. She just somehow knows by instinct what to put in a recipe and how much. I got this recipe from watching her prepare lasagne for a huge group of guests. As she worked away, I jotted down what she was doing. I couldn’t believe that you didn’t need to cook the noodles first, and it turned out great! Cover with foil and freeze. When ready to use, *thaw in refrigerator and then bake covered at 350 degrees for about 1 hour, or until knife inserted in center indicates the noodles are tender. If you notice it is getting dry while baking, pour a bit of water around the edges. I have been reading your freezer meal plans and ideas – love them! For years I tried making lasagna, and it was always a disaster. I finally gave up, which made me sad because it's one of my husbands favorite foods. The only time he got to eat it was in restaurants or the frozen kind from the grocery store (yuck). When I saw your recipe I decided to give it one more try. It had been years and your recipe seemed different. IT WAS A SUCCESS!!!!! I am so happy!! My husband ate four helpings! Thank you so much for the wonderful recipe! I'm sure I'll be making it for years to come.